My essay is about Alan Bleasdale's two plays &quot;Jobs For The Boys&quot; and &quot;Yossers Story&quot; from the series &quot;Boys From The Black Stuff&quot;. My essay is about Alan Bleasdale's two plays "Jobs For The Boys" and "Yossers Story" from the series "Boys From The Black Stuff". Bleasdale wrote these plays to show how serious unemployment really is. 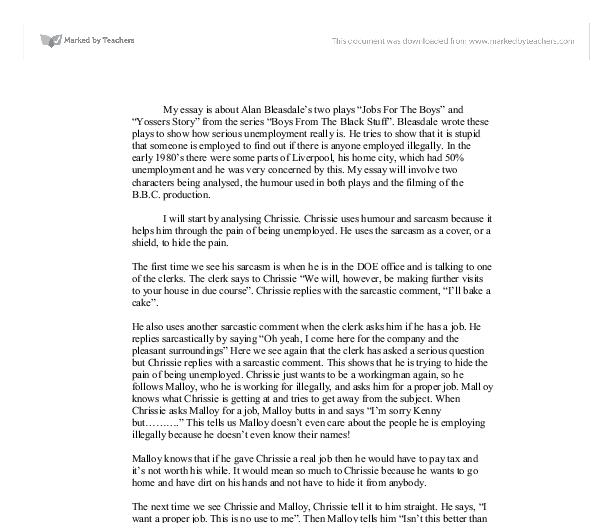 He tries to show that it is stupid that someone is employed to find out if there is anyone employed illegally. In the early 1980's there were some parts of Liverpool, his home city, which had 50% unemployment and he was very concerned by this. My essay will involve two characters being analysed, the humour used in both plays and the filming of the B.B.C. production. I will start by analysing Chrissie. 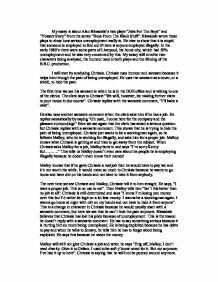 Chrissie uses humour and sarcasm because it helps him through the pain of being unemployed. He uses the sarcasm as a cover, or a shield, to hide the pain. The first time we see his sarcasm is when he is in the DOE office and is talking to one of the clerks. The clerk says to Chrissie "We will, however, be making further visits to your house in due course". Chrissie replies with the sarcastic comment, "I'll bake a cake". He also uses another sarcastic comment when the clerk asks him if he has a job. ...read more. Where Chrissie hides his pain with sarcastic comments and humour, Yosser starts to lose his mind, and everything else along with that, his children, his house, his whole life. We learn in the first scene that he cares about his children immensely but as the play goes on we see he get over protective of them. He feels everyone is trying to take them off him. Yosser has a number of habits, like saying his name to everyone he meets, saying he could do every job and head butting. He is obsessed with his name because he is proud of who he is. He wants everyone to know who he is. And the one thing unemployment can't take from him is his identity. But in the end of the play he hardly says his name, this is because he does not want it anymore. This is a form of dramatic irony. We see this head butting when he is trying to get a cell for the night, after his children have been taken from him. He smashes a window and an alarm goes off and shortly after two policemen arrives. They start to arrest the wrong person when Yosser tries to tell them it was actually him that broke the window. ...read more. He also made the camera like a first person mode when Yosser is talking to his children and they look up at him you see it in the children's view. Serille used make up to full effect when Yosser looks almost de-humanized just after the policemen pull him out of the water. Also in the D.O.E. office you can hear everyone talking and moving about and this also adds to the effect that it is more like a documentary. Serille doesn't decide to make the background noises quieter like they might in films or soap operas. He keeps them as loud as they normally would be this is to give it the effect of a documentary . I think all the actors were well suited to their parts, especially Yosser (Bernard Hill) because he coped well and made it look and feel like I was watching a real person going through the motions. I know how bad unemployment is and how it can effect people. I think that Alan Bleasdale has put his views across very well because he made me laugh at the 'desperate Dan' pun and then realise how much help Yosser needed. But I feel that he tried to say that everyone on the dole is unhappy and would rather work for his or her money but I feel this is not true because there are some lazy people that would rather get money for doing nothing. ...read more. Unemployment: Where is it Going? This privatization program, or as the government calls it "The Economic Reform and Structural Adjustment Program (ERSAP)" (El Fiqi 1), has been carried out by the government in order to reform the structure of the public sector. However, privatization turned to be one of the major causes of the rapid increase in the rates of unemployment. Like all the boys in 'Jobs for the Boys' he has allowed himself to be exploited by Malloy. In the play he does express his political beliefs to Snowy and why he has had to go against them. He says "...when you're scared, unless you're special you think about yourself -and yours.